This is the first in a trio of pictures, which were painted expressly for the weekend exhibition at the Luton Hoo Walled Garden Marquee. I discovered this exhibition while eating in the Whetherspoons’ ‘White House’ pub in the Galaxy Centre Luton. I was reading a free local “what’s on” magazine which mentioned it being only a few weeks away. I decided to take on this challenge and submit some work. There was a little vagueness in that their web site and the magazine slightly differed in the brief. One said the exhibition was “Seasons in the Garden” while the other just stated that work should be connected to gardens in some way. As time was tight, I plumped for using existing deep edged frames that negated having anything framed and the time that would add to the process. I think the frames were already in stock so the process was fairly simple:- Trawl through various photos on the computer and find some sort of detail of fawner that created an interesting composition suited to the format of the chosen canvas. This was the largest of the canvases, and the detail is from the sloping bank behind a railway station platform. 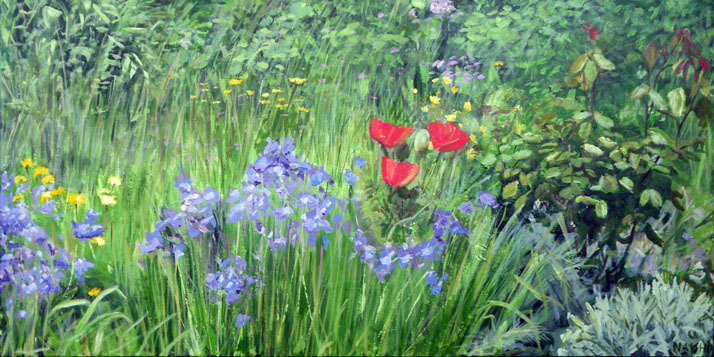 Memory is a funny thing, and for a long time I was convinced that these wild flowers belonged to Horstead Keynes on the Bluebell line – with such clarity that I swear I could walk you to the spot to this day. My wife shattered the illusion however when she found the original on the computer and its from completely different station which I have never even been too! Shocking – call myself an artist? I can’t claim to have a full relationship with this place!